Over the years, there have been many films that dealt with the dreams and aspirations of children, but Ali Zaoua: Prince of the Streets, a Moroccan movie directed by Nabil Ayouch, takes a singularly unique approach to this subject. The children at the center of Ali Zaoua are all alone, abandoned by their families, and suffering a sad, poverty-stricken existence on the streets of Casablanca. For them, dreams aren't so much a luxury as they are a means of survival, providing hope where none exists, and promising better days ahead, no matter how empty that promise might be. Ali (Abdelhak Zhayra) is one such child. Having just quit a local street gang, Ali wants only to travel across the sea and live out his days on a tropical island. In fact, he plans to set sail for his island within the next few days, but fate will intervene. As Ali and his three friends, Kwita (Mounim Kbab), Omar (Mustapha Hansali) and Boubker (Hicham Moussoune), are whittling away the hours in an abandoned construction site, they're confronted by a gang of kids led by a deaf-mute named Dib (Saïd Taghmaoui), the same gang that Ali belonged to, but left so that he could pursue his dreams. Dib orders Ali to return to the fold, and when Ali refuses, another kid throws a rock that strikes Ali in the head and knocks him unconscious, leaving Kwita, Omar and Boubkar to care for their wounded companion. While being dragged by the three of them through the streets on a makeshift stretcher, Ali dies, and the friends agree that he deserves a first-class funeral. Each will do what they can to raise money for a burial at sea, certainly a fitting ceremony for a ‘prince’ such as Ali. Whether or not they're successful in their mission, this ordeal has, at the very least, taught Kwita and the others the need to experience a bit more of what life has to offer. The confident exuberance that drew them to Ali has, in turn, given each of them a new appreciation for life. Ali was the outlet for all of their aspirations, the one who showed them that dreams were not impossible. He came close to fulfilling his, and now, Ali's hopes for a better tomorrow have been transferred to his friends. 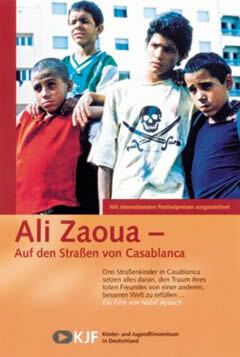 Ali Zaoua: Prince of the Streets is a fascinating cross between drama and documentary. The children who star in this film are not actors, but actual Casablancan street kids, and their performances are nothing short of amazing. Director Ayouch shows great compassion for the plight of these children, infusing the film with a tone that is never strained or artificial, and always observant. These kids, forgotten by their families, suffer through life’s pitfalls on a daily basis, and the only thing that gets them through it all is their dreams, their hopes for a better tomorrow. Ali Zaoua is a film you won’t soon forget; an account of the exuberance of youth played out on a stage decorated by society’s most abhorrent contempt. This one is on my list, and I've been not avoiding it, but choosing other movies in front of it. I'm far more interested in it now. @Steve: Thank you, sir. This is definitely one to check out sooner than later. For amateurs with no acting experience, the kids in this movie are truly impressive. I'll be very anxious to hear what you think of it. I haven't seen this but now plan to watch.